The Sumerians moved to the land between the Tigris and Euphrates Rivers about 3500BCE. We do not know where they came from; they were probably nomads who discovered the fertile land of Mesopotamia. Nomads travel in small groups until they have eaten the food and hunted the animals in their area. When food is no longer plentiful, the nomads move to a new area. Some people continue to live nomadic lifestyles in remote parts of the world to this day. Eventually, the Sumerians developed a civilization. They learned that by planting seeds and plowing their land, they were able to grow crops. The Sumerians learned to domesticate, or tame animals to help them plow their lands. They built ditches and canals to make their farmland more productive. The artificial application of water to improve farmland is called irrigation. The Sumerians also made a very important invention–the wheel. The invention of the wheel made it possible to pull heavy loads. The Sumerians were polytheistic, which means they believed in many gods. The Sumerians worshiped their gods at huge temples they called ziggurats. They dedicated each ziggurat to a different god, whom the Sumerians believed ruled over their city-state. When a city was conquered, the invaders would force the conquered people to accept their gods. Most people in the Western Hemisphere today practice monotheism. This means they believe in only one God. Christianity, Islam, and Judaism are all monotheistic faiths. The Sumerian city-states flourished for more than one thousand years, but in time, Sumerian farmland became less productive. At about the same time, rival city-states emerged further upriver in Mesopotamia. 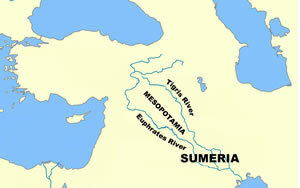 The Sumerians lived near the confluence of the Tigris and Euphrates rivers. The Sumerians worshiped their gods at huge temples they called ziggurats. This Sumerian religious figurine is estimated to be 4700 years old. 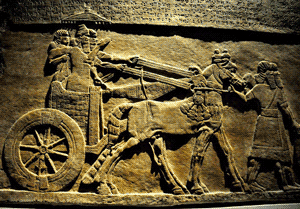 This carving depicts a Sumerian war chariot.